Initially when i started blogging, i dont know that much difference between the Naan and Kulchas. I was like both are same then later i came to know the difference, yes Thanks to blogging world.Kulchas is a cousin of Naan, made with baking soda/baking powder instead of Yeast as naan goes for Yeast. This Indian flat bread is made with leavening agents, sometimes they are stuffed with spiced vegetable stuffings.Kulchas is quite a typical Punjabi recipe and Amritsar, a city in Punjab is famous for its kulchas and Naans.Usually eaten with chole aka channa masala, Kulchas makes a filling breakfast or dinner. If they are stuffed, they doesnt even need any side dish to have with. For our this month's Indian Cooking Challenge,a monthly event where we cook dishes from various regions of India.For this month's challenge, Srivalli suggested us Amritsari Kulchas, since i have already prepared them i pinged Srivalli asking whether i can change the stuffing. She immediately said Yes and i opted for Matar/Green peas filling. I used frozen green peas and cooked it with usual spices. 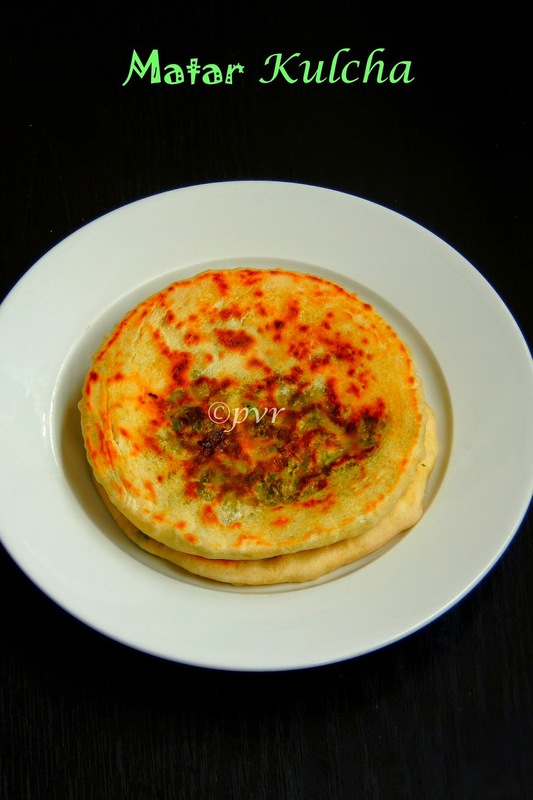 We had this green peas stuffed kulchas with Paneer butter masala for our dinner and we had a satisfying dinner. Coarsely grind the green peas and keep aside. Heat the oil in a pan,add the cumin seeds and fry. Add the greenpeas mixture and saute in low flame for few minutes. Now add the chilli powder, amchur powder, chaat masala, coriander powder and salt and sauté for 2 to 3 minutes. Cook until the mixture turns dry. Allow the mixture to cool completely and divide into 4 equal portions. Mix the flour,baking soda, baking powder, oil, yogurt, sugar and salt in a bowl. Add gradually the warm milk and turn everything as a soft but not a sticky dough, cover the bowl with a damp cloth and keep aside for an hour. Now flatten a portion of the dough, place a spiced green pea balls in the centre. Fold the dough to form a ball, dust the dough with flour and gently flatten them as round disc..
Heat few drops of oil, gently drop the flattened kulcha. Cook on both sides until the kulchas turns golden brown. Brush the hot kulchas with butter. look so good. would love to have some! 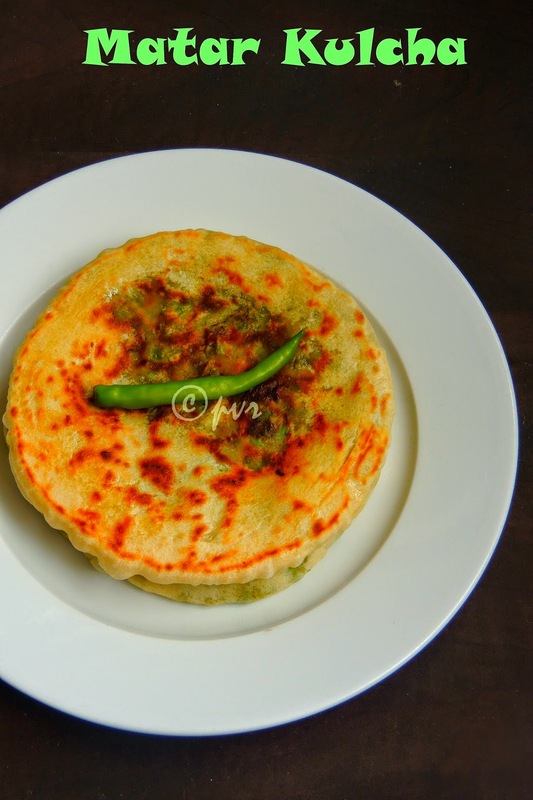 Delicious kulcha.. love it with curd and pickle..
Matar kulcha looks so delicious and tasty ....... Wil try this ! Kulchas are my favorite, your stuffing is delicious! The stuffed kulcha is a great idea, Like you I thought Naan and kulchas are the same. I will bookmark this to make soon. Your kulchas look so amazing Priya..very nicely made.. Loved the stuffing.. Kulcha looks delicious.. Absolutely delicious and so very perfectly done..